The unique design of the Westin Seattle offers breathtaking views of the Northwest's beauty, including Lake Union, Puget Sound, and the Olympic and Cascade mountain ranges. This hotel features 891 smoke-free guest rooms and suites designed to provide ultimate comfort and tranquility. 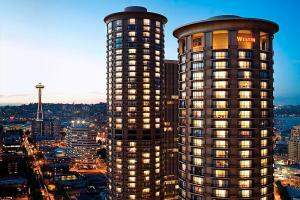 The Westin Seattle is the front door to downtown shopping, attractions, dining and the vibrant theater district. Located in the heart of Seattle just 15 miles from the Seattle/Tacoma International Airport.